Eat your veggies. | love lives on. Melvin has another liver blood test coming up. After the last blood test I started feeding him (more) veggies. I don’t have a lot of control over what he can eat based on all the things he can’t eat but most veggies and fruits that dogs can have, he seems to tolerate. There are sometimes extra itchies but I’m trying to boost his overall health so that is a somewhat small price to pay if this works/helps. Either way, he and Jake seem to LOVE the veggies and that makes me happy! At first it was a lot of work but now I just plan their meals for the week so I don’t have to be cooking last minute. They always get some pumpkin (gotta promote regularity) and I have been adding two other veggies to their meals. 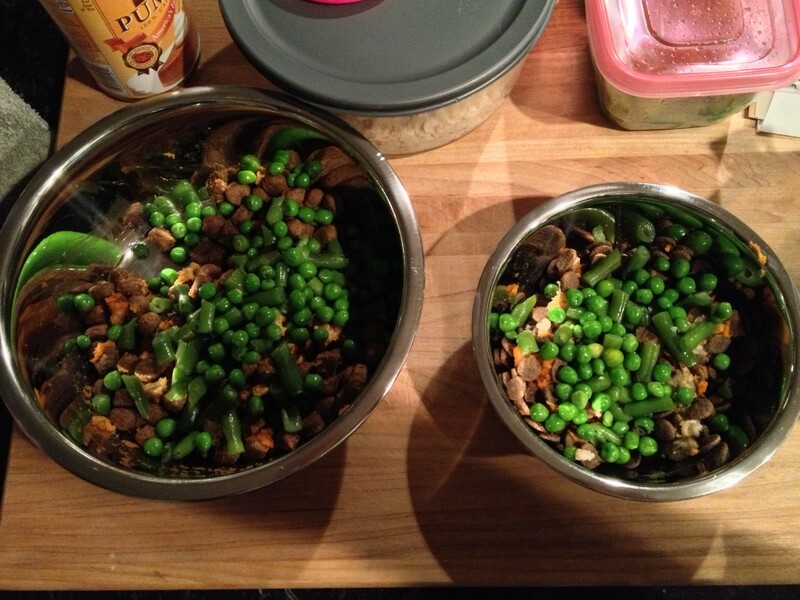 Most of the veggies are cooked (except the carrots and peas). Oh and PS, the dogs are doing great! They now eat next to each other. Boom! Yay for eating next to each other! And yay for kiddos who love their veggies! So glad things are progressing! While I don’t cook Ru’s food at home, we always add in extras like pumpkin and other types of squash, some wet or solid meats and fish oil/supplements. I soooooo want to add other stuff to Jake’s food but he has started showing signs of allergies also so I have to deny that urge! I think it would be so fun to mix it up with meats and goodies! Ru-man must love mealtime! The biggest hurdle for feeding them together is that I have to grab Jake’s bowl as soon as he finishes so that Melvin does not have a chance to lick it (since they get different kibble). I 100% agree with you on not broke/don’t fix approach! Love that you added veggies!!!! Mazzie’s nutritionist told me chop up all of her vegetables in a food processor and add a probiotic (Prozyme) to ensure that she digests them easily and gets the maximum nutritional benefit. And I have to say, I didn’t love finding various types of whole vegetables in her poo, which ceased after I started doing the trick above. Yes, finding whole peas in their poop is not ideal at all!!! I mash it all up once it’s in the bowl and that seems to do the trick! 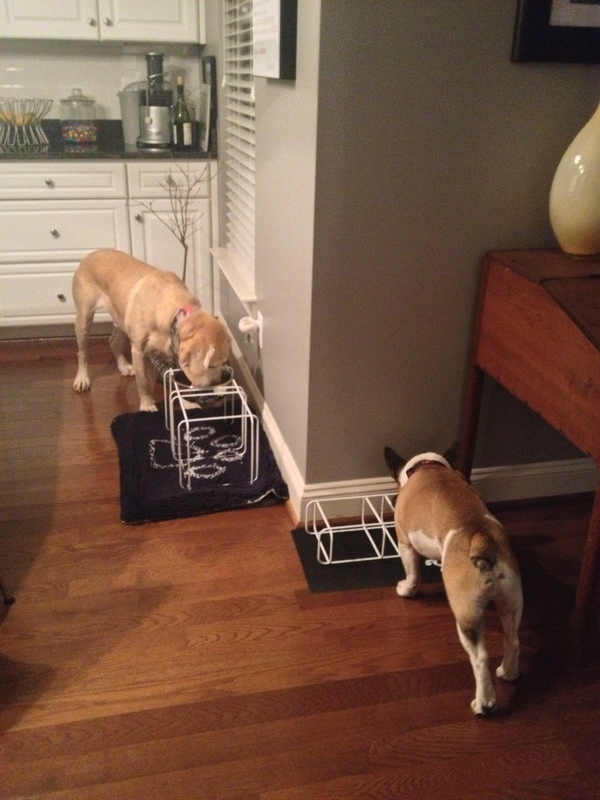 I think they are better at eating their veggies than I am… seriously… and way to go eating next to each other! I know! They def eat better than I do! 1) Their food actually looks delicious. 2) Eating together is huge! Wow! Those are some well fed pups! I thought we gave Athena a good amount of fruits and veggies, but I think you win the gold medal! And way to go Melvin and Jake for successfully eating next to each other! Woot woot! I like Mazzie Takes Manhattan’s comment above about putting the veggies in the food processor first. I always find big chunks of carrot in Athena’s poo. 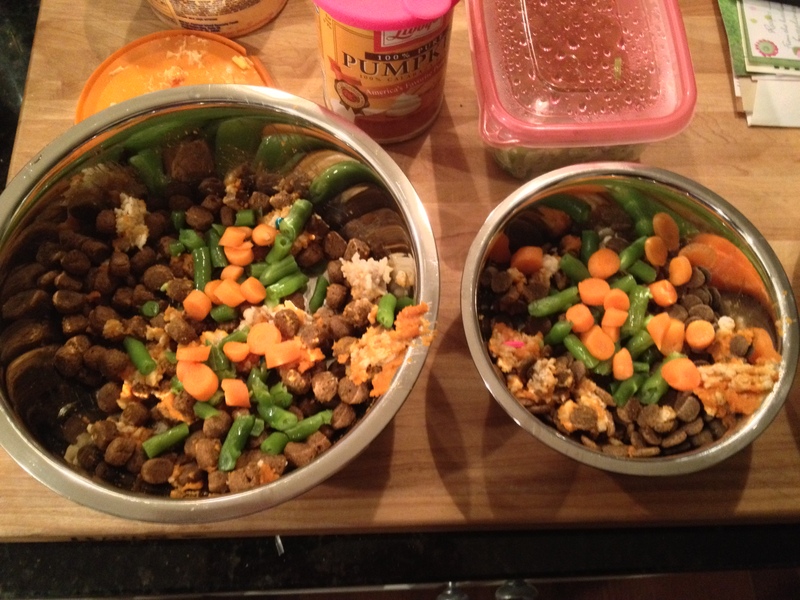 I also think that the food processed veggies work work great in our Kong concoctions!